The Captain Parker’s Story from Thomas Milkey on Vimeo. Gerry Manning, a former Boston schoolteacher, had dreamed of owning a restaurant from his boyhood days when he would help out in a cousin’s restaurant in Scituate, The Olde Satuit Grille. While he attended Boston College, during the summers he worked in various restaurants and continued to do so when he became a teacher in the Boston school system. 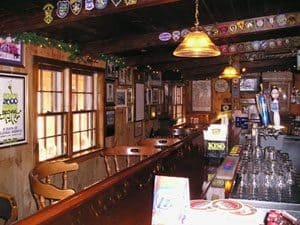 Finally in July of 1981, Gerry’s dream became reality when he opened Captain Parker’s Pub which has been open every day since (except one snowy day in 2005), even during an expansion in 1985. Overlooking the Parker River in West Yarmouth, MA, Captain Parker’s serves lunch and dinner seven days a week, and is best known for the multi-award winning, thick and creamy, New England clam chowder. The menu offers fresh seafood, choice meats, homemade soups & sauces, all freshly prepared on site and available for take-out as well. Captain Parker’s is a family friendly restaurant where you’re sure to see the same familiar faces among the staff as well as the patrons. The bar at Captain Parker’s is a congenial Cape Cod pub with plenty of local color. It’s a friendly place for a drink, a snack or a full meal and you’ll be served by one of our professional bartenders; Chris, John, Mike, Whitney or Roger. On your own or with others, come as you are. If you want to watch “the game” there are 5 flat screen televisions, Keno and lottery tickets are available. While in the bar you can peruse the collections of golf balls, patches and sports memorabilia. The restaurant opens at 11:30 A.M. daily. Whether you’re looking for a light offering, a full meal, or an appetizer with your drink at the bar, you’ll find it at Captain Parker’s. It’s easy to find but awfully hard to leave!